The Foundation for Landscape Studies is pleased to announce the winners of the 2008 John Brinckerhoff Jackson Book Prize for recently published books that have made significant contributions to the study and understanding of garden history and landscape studies. The winners are listed in alphabetical order. In the years following World War II, Americans visited the national parks in unprecedented numbers, yet Congress held funding at prewar levels and park conditions steadily declined. Elimination of the Civilian Conservation Corps and other New Deal programs further reduced the ability of the federal government to keep pace with the wear and tear on park facilities. To address the problem, in 1956 a ten-year, billion-dollar initiative titled "Mission 66" was launched, timed to be completed in 1966, the fiftieth anniversary of the National Park Service. The program covered more than one hundred visitor centers (a building type invented by Mission 66 planners), expanded campgrounds, innumerable comfort stations and other public facilities, new and wider roads, parking lots, maintenance buildings, and hundreds of employee residences. During this transformation, the park system also acquired new seashores, recreation areas, and historical parks; agency uniforms were modernized; and the arrowhead logo became a ubiquitous symbol. To a significant degree, the national park system and the National Park Service as we know them today are products of the Mission 66 era. 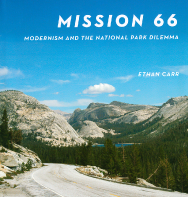 Ethan Carr's book examines the significance of the Mission 66 program and explores the influence of mid-century modernism on landscape design and park planning. Environmental and park historians, architectural and landscape historians, and all who care about our national parks will enjoy this copiously illustrated history of a critical period in the development of the national park system. The discipline of landscape architecture encompasses many typologies, from domestic gardens and neighborhood playgrounds to urban designs and state parks. Most critical studies of the discipline tend to approach it from a historical or contemporary perspective organized around criteria such as built versus unbuilt, urban versus peripheral, or competition-sponsored versus commission-based. Very few analyses have been undertaken from the seemingly obvious jumping-off point of size. In the eight essays that make up Large Parks, leading scholars and practitioners engage in depth the topic of large urban parks as complex cultural spaces, where issues of landscape discourse, ecological challenges, social history, urban relations, and place-making are writ large. From historic parks such as New York’s Central Park and Paris’s Bois de Boulogne to contemporary projects such as Toronto’s Downsview Park, Staten Island’s Fresh Kills, and California’s Orange County Great Park, Large Parks highlights the complexities and special considerations that go into designing these massive and culturally significant works. This two-volume set includes a photographic reproduction of an anonymous seventeenth-century Italian gardener’s notebook and a scholarly study, transcription, and translation of this valuable historical record. The notebook, which belongs to Dumbarton Oaks’s Rare Books Collection, is a record of the planting of three flower gardens at San Lorenzo. Three computer-generated re-creations of the garden’s planting beds are included with the reproduction. It is now believed that the gardens were created for Margherita de’ Medici Farnese, duchess of Parma and Piacenza. The notebook provides insight into the creation of a seventeenth-century garden, from identifying flowers to planning flowerbeds. The sketches reveal the gardener’s own intentions and reflections on the designs. Ada Segre’s accompanying study of the notebook is a groundbreaking example of garden archaeology. She considers its provenance and connection to the world of the duchess and her gardens. 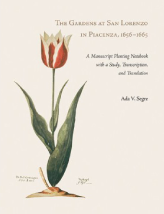 Segre also evaluates the importance of the manuscript as an object and as a source of information on garden design and practice in Italy during the mid-seventeenth century. The Appalachian mountain chain once contained the highest and most dramatic mountains on earth. Worn down over time, these mountains still hold some of the most diverse climactic zones and singular geological formations in existence. 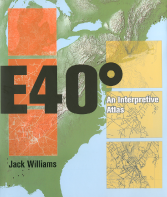 In East 40 Degrees: An Interpretive Atlas, Jack Williams examines a succession of beautiful but little-known towns along this cordillera (a term descended from the Latin chorda, meaning “braided rope”), excavating layers of history and geography to reveal how diverse cultural and social circumstances and geological histories came together to form each town’s distinctive character.